Million-dollar view, defined in Cleveland. From the moment you walk in the door, 10' walls of glass give you a feeling of floating right inside the downtown skyline. 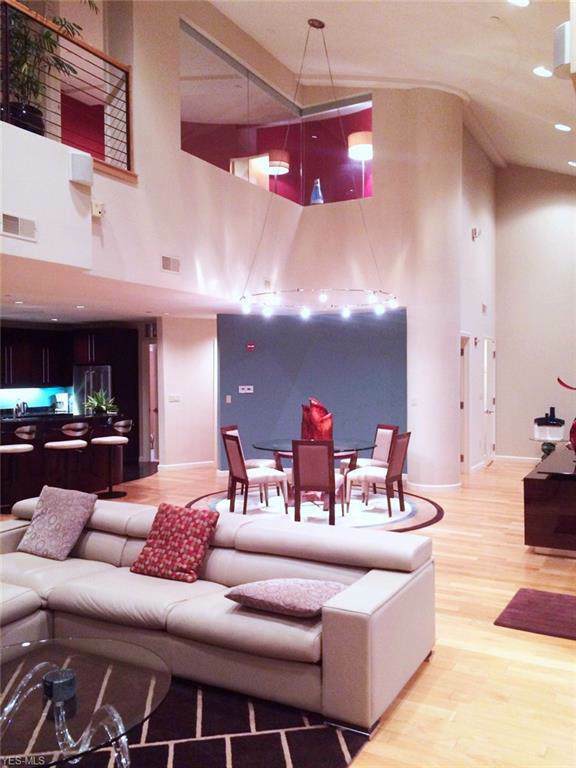 21' ceilings make the Richard Fleischman designed interior no less spectacular, all on its own. One of the most architecturally sophisticated interiors in Cleveland is a symphony of form, with circular walls turning on columns to define the living spaces. The round dining room dramatically takes shape under a floating circle of lights, and is the centerpiece of the main floor. 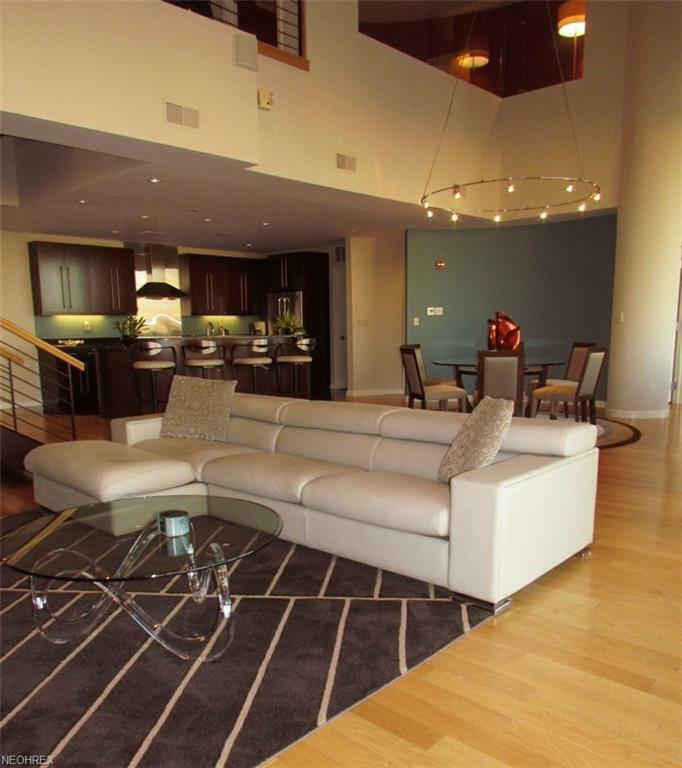 The living room dominates the space with views across the skyline and the whole eastern shoreline. A granite fireplace, media wall and wet bar frame the space. A second living room is the alternate third bedroom, with a full black marble bath. The first floor finishes with an elegant study, with floor to ceiling mahogany bookshelves that include additional wine storage. The kitchen follows the curving walls with its own gracefully curving island and breakfast bar in gorgeous black granite. A dramatic floating staircase takes you to the second floor where two bedrooms with plate glass walls overlook the main living space. The second bedroom's Murphy bed blends into the wall, creating a completely convertible upstairs den. And the master suite sums up the design with full, circular walls, an Italian marble bath, and a double dressing room with walls of racks, custom shelving, and cabinets. 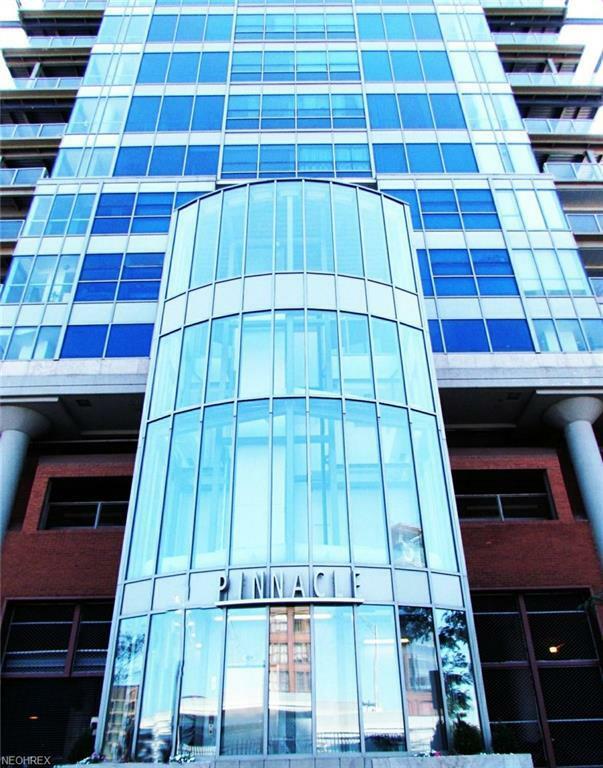 Full Pinnacle Amenities. Tax abated through 2021. Hoa Name Pinnacle Condominium Owners Assn. Listing provided courtesy of Re/Max Real Estate Group. Listing information © 2019 NEOHREX Multiple Listing Service. All rights reserved. The data relating to real estate for sale on this website comes in part from the Internet Data Exchange program of NEOHREX. Real estate listings held by brokerage firms other than RE/MAX Edge Realty are marked with the Internet Data Exchange logo and detailed information about them includes the name of the listing broker(s). Information Deemed Reliable But Not Guaranteed. The photos may be altered, edited, enhanced or virtually staged. Data last updated 2019-04-20T08:07:13.493.